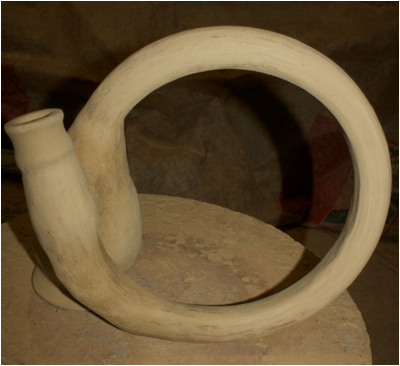 The Numantian clay trumpets are ultracircular aerophones dated to the 2nd and 1st Centuries B.C. 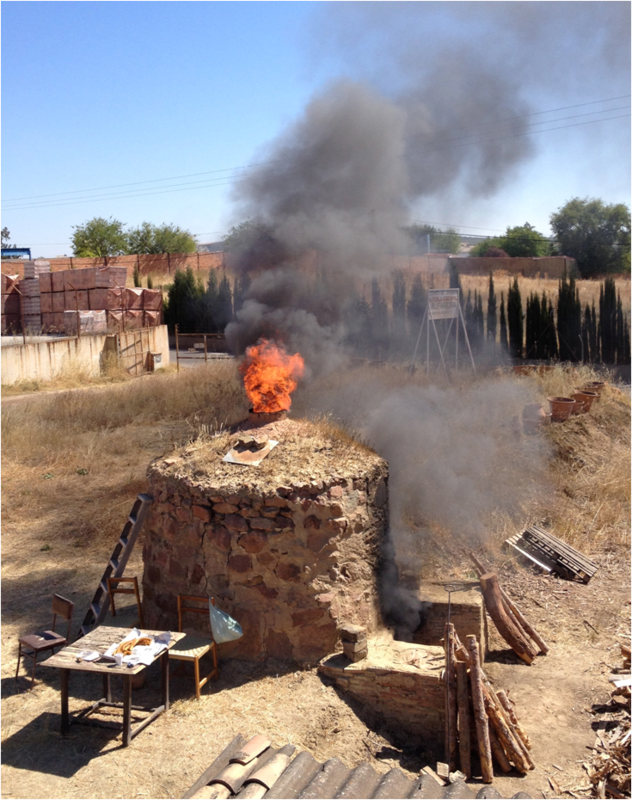 that were built and used by the Arevaci people, a Celtiberian tribe that inhabited the lands between the Central Mountain System and Duero Valley, in the half North of the Iberian Peninsula. 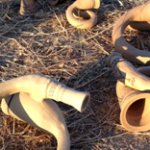 This instruments are very probably the clay version of the famous Celtic Carnyx, as the Arevaci people were doubtlessly the best potters of the Celtic world due to their close contacts with the Mediterranean Iberian cultures. 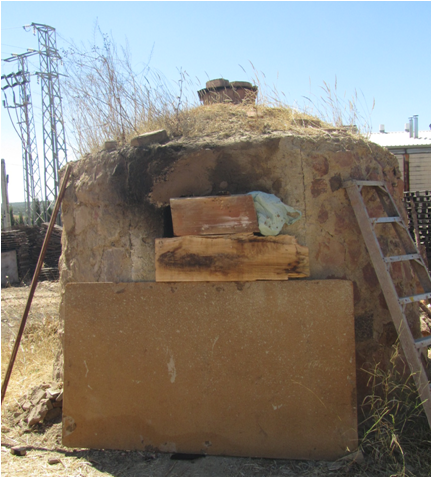 There are almost a hundred remains in several museums, mainly coming from the main Arevaci city, the famous Numantia. 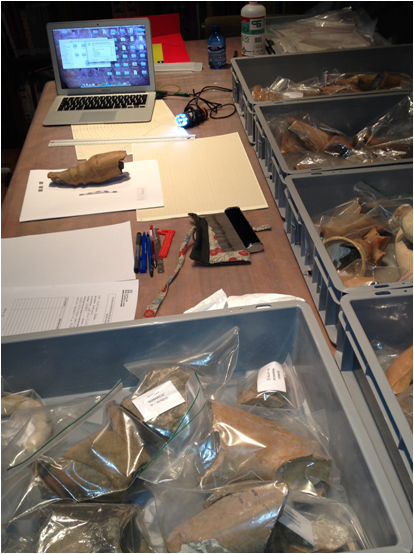 The remains include several mouthpieces, fragments of tubes, bells and even some almost complete examples. 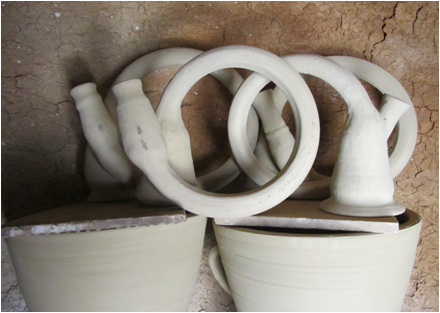 The work in the museum let us understand the production process of the pieces as well as the study of their organological and acoustic functioning. 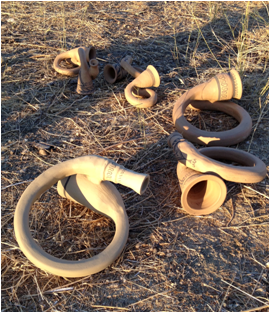 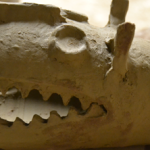 The first step is the cataloguing and documentation of all the remains of clay aerophones. 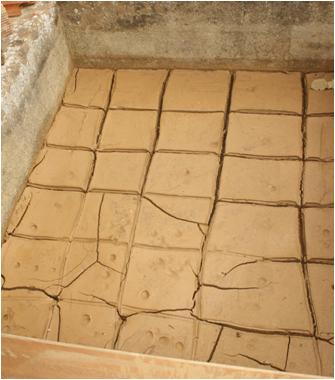 The remains are also drawn with archaeological drawing techniques that let us continue our study of the pieces outside the museum. 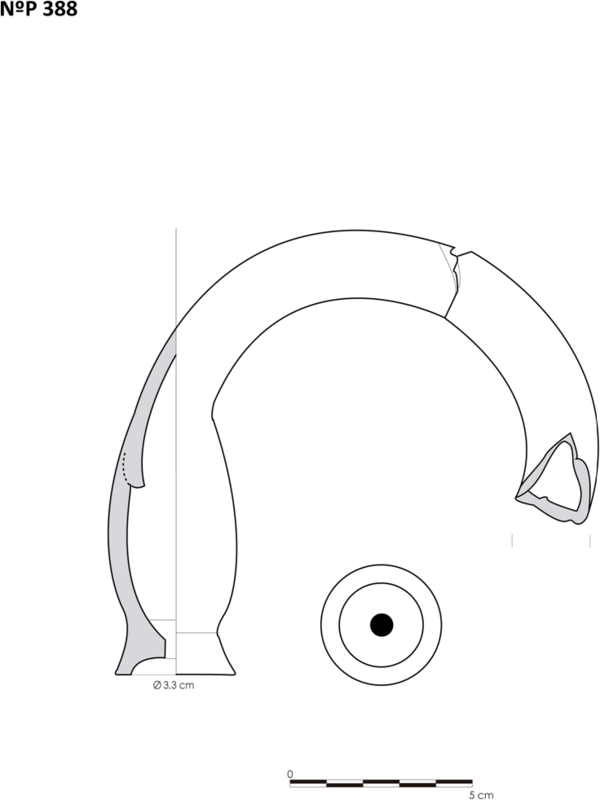 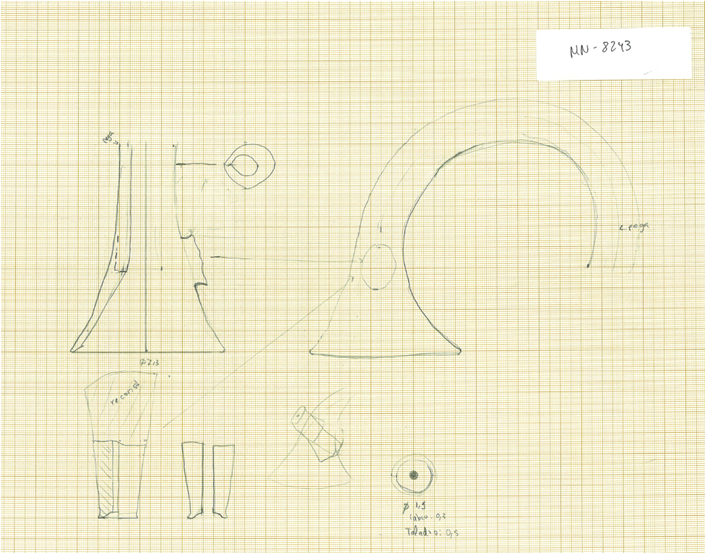 As well as the drawings, the diameter of the tubes is calculated when possible using different techniques depending on the fragment length. 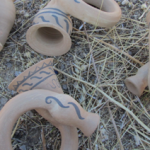 The study of decorations is also necessary as it not only will let us make accurate replicas, but can illustrate us about symbolic conceptions linked to this instruments. 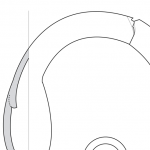 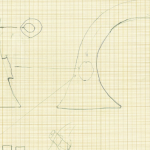 These studies with the remains permit us to make computer drawings and plans of all the fragments. 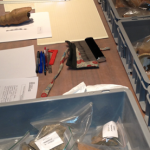 This process is necessary not only to cataloguing and register these musical instrument remains, but also to produce replicas that will have the same functional and organological characteristics. 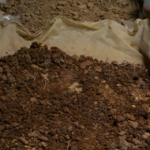 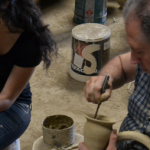 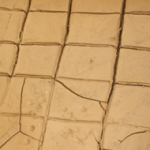 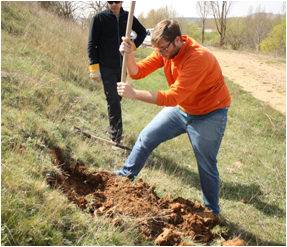 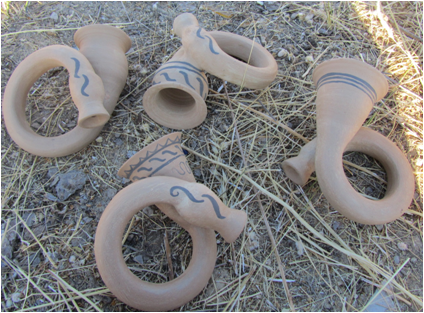 In order to make instruments as similar as possible to the archaeological ones, we have tried to replicate the production process of the Iron Age, including the recollection of clay in different locations that were likely used by the Celtiberian Numantian people. 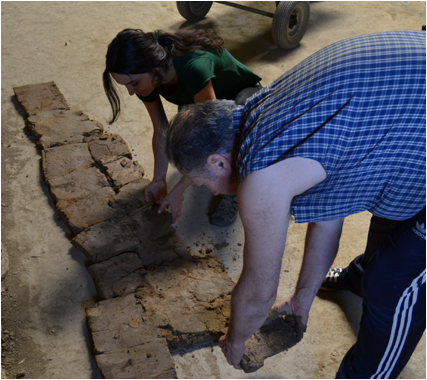 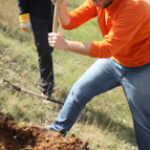 The director of the Numantia settlement and EMAP Scientific advisor, Alfredo Jimeno, has collaborated with EMAP and the researchers of AEECA association (EMAP´s associated partner). 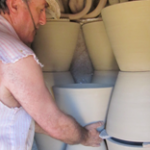 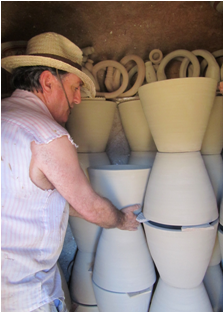 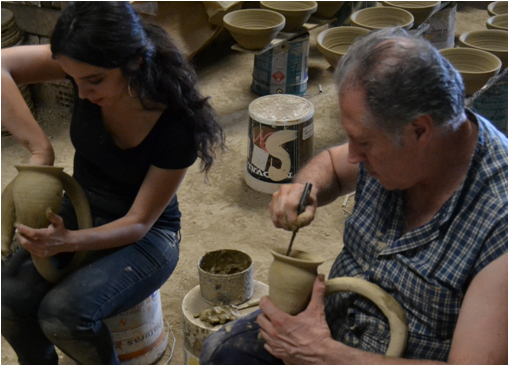 Thanks to the collaboration of the traditional potter artisans from Bailén (Jaén), Antonio Padilla, we have prepared the different clays in the traditional fashion. 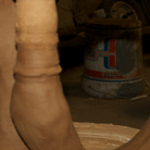 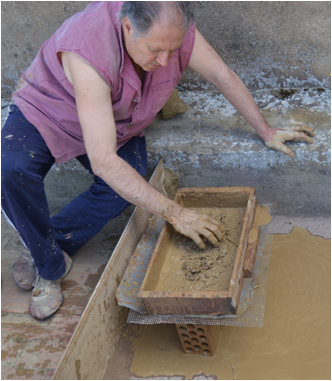 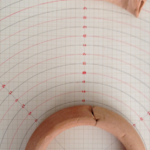 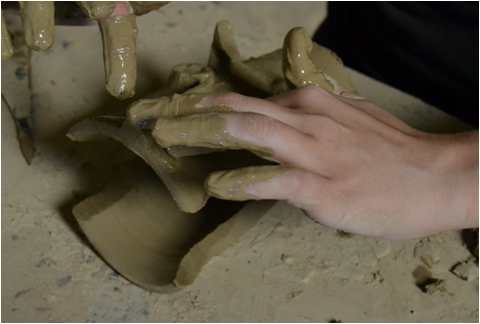 Once the clay is ready, the construction of the instrument begins. 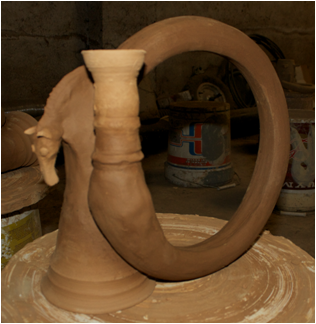 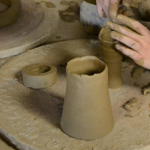 The tube, mouthpieces and bells are build in the potters wheel and then assembled. 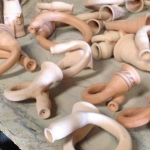 Different typologies of mouthpieces and different tube sizes were produced. 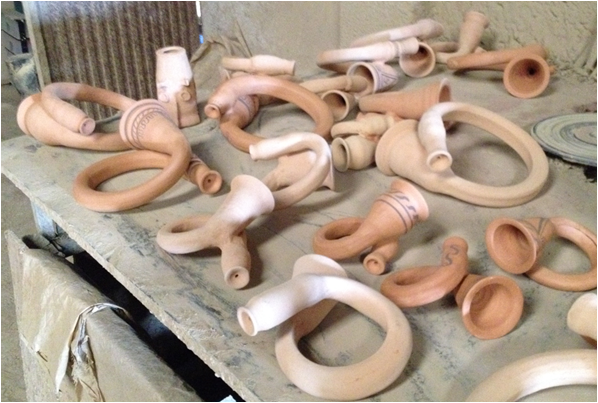 Once they are assembled, they are put to dry. 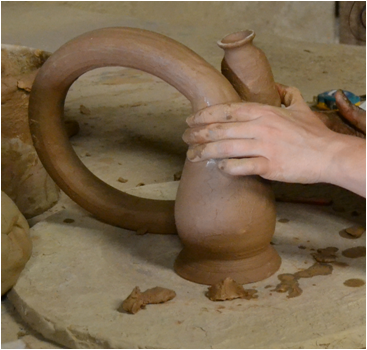 Before the instruments are completely dry, the final details are corrected. 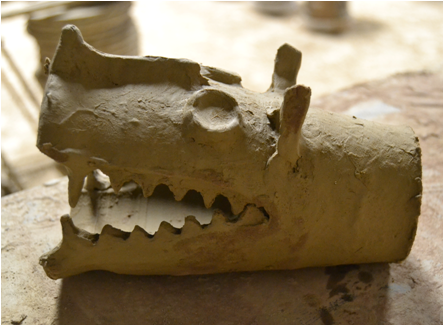 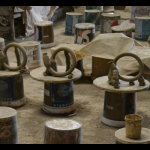 We have also made the first attempt to reconstruct the zoomorphic bells that appear in some of the archaeological instruments. 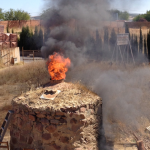 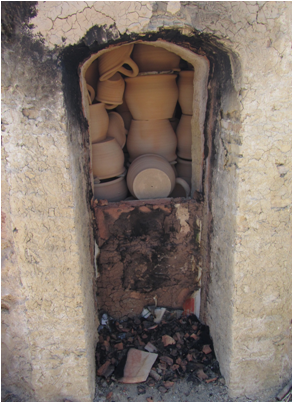 The firing of the pieces was done in the replica of a kiln built after the study of Iberian kiln remains from the 2nd Iron Age. 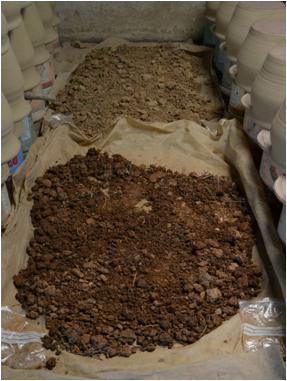 The dry instruments are put inside the combustion chamber, together with an important amount of other earth ware products. 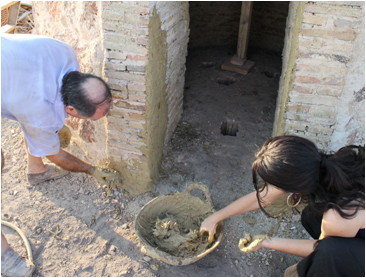 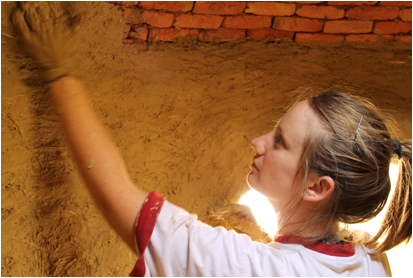 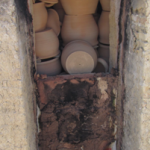 The chamber need to be filled as much as possible in order to keep the right temperature during the firing. 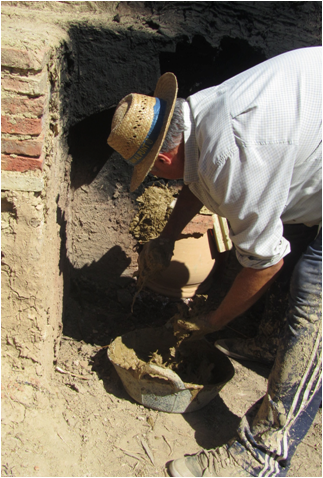 The kiln replica permits us to fire the pieces using wood, reaching temperatures between 750°- 900° according to the pyrometer. 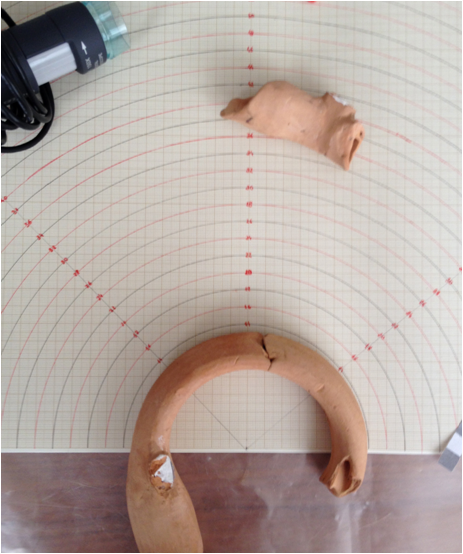 These firing temperatures coincide with the results of archaeometric analysis on the original pieces. 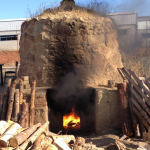 Once the firing is almost finished, the fires reaches the combustion chamber and can be seen through the chimney. 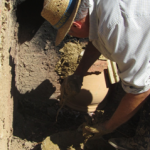 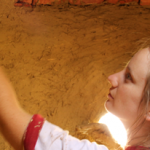 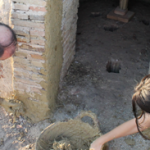 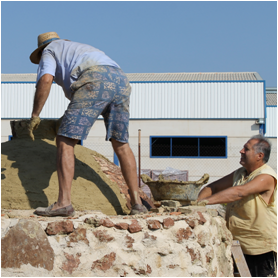 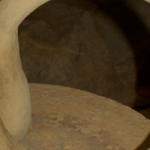 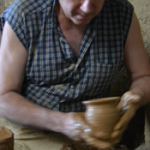 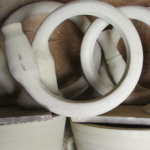 Once the firing is finished, the kiln is closed for three days, waiting for the temperature to decrease, to avoid the breaking of pieces due to thermic constrast.The work with traditional potters also let us observe Ethnographic traditions very valuable to the ethnoarchaeological study of clay production processes. 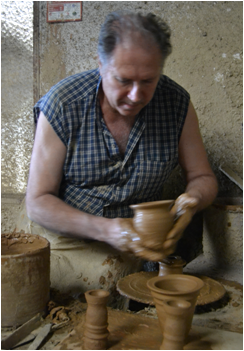 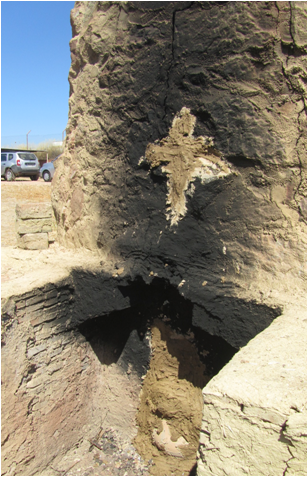 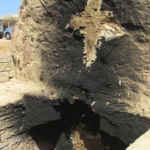 Once the kiln was closed, the potters make a cross with clay. 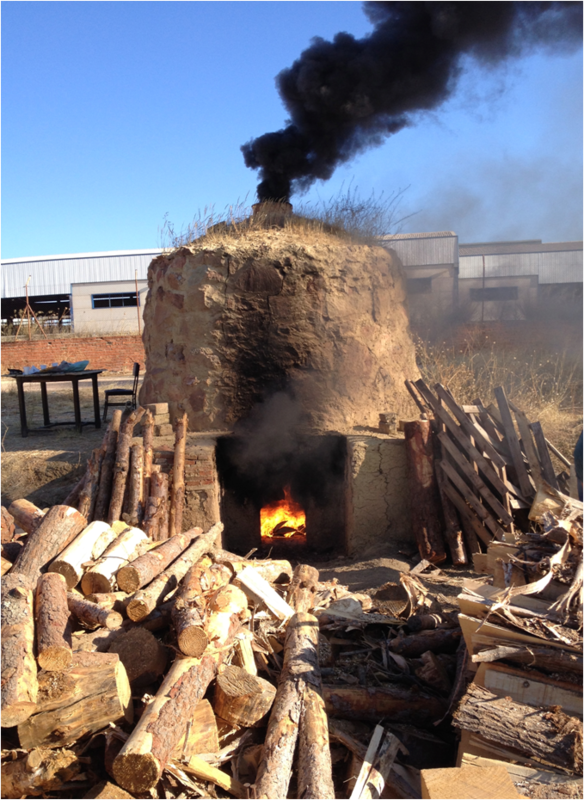 This is a symbol of the importance of this part of the firing process. 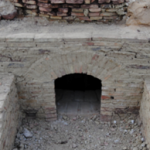 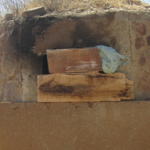 These protective ritual acts linked to kilns appear in many cultures throughout the world. 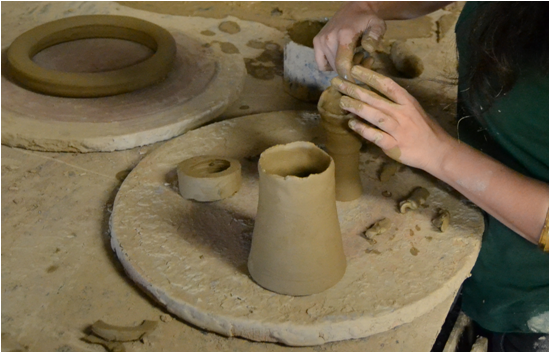 After three days, the kiln is open and the pieces are fired, ready to be played and studied. 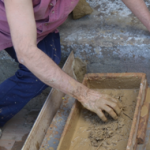 Archaometric analysis will be carried out in the lab of the CERVITUM study group of the CSIC (EMAP´s associated partners). 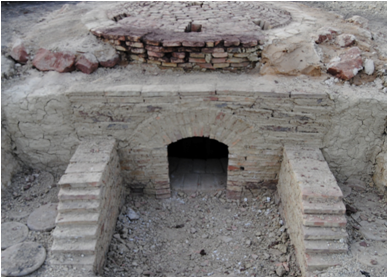 X-ray Diffraction (XRD) and X-ray Fluorescence (XRF) can tell us about the firing temperature, the clay components and some acoustic properties of the material, permitting us to compare the results with the ones of the original archaeological findings.